Ever since she was bitten by a tiny creature on her fifth birthday, Joclyn Despain has had to deal with a strange mark on her neck. She doesn't know why it's there, but she doesn't want anyone to see it, especially her best friend Ryland, who's grown up alongside her. What she doesn't know is that the scar is the reason she's being hunted, even though she doesn't know it. When her estranged father sends her a strange birthstone for her sixteenth birthday, Joclyn finds that it triggers something inside of her, something that has a tall blonde stranger stalking her, and has her throwing a high school bully ten feet across the air. But before she can figure out what the mark really means, Joclyn is plunged into an unearthly adventure of magic and murder. "Kiss of Fire" has a fairly unique take on magic which made the novel extra exciting. Sure, the characters can blast beams from their hands and call the wind to their bidding, but what was really interesting were the origins and history of the magic. For example, those born with latent powers are bitten by special little creatures who, lo and behold, leave behind a mark, and these people are called Chosen Children. On the other hand, people who knew from the moment they were born that they harnessed magical powers originate from Prague, the source of all ancient magic, and even within them they are separated into different 'races' based on their powers. Plus they speak Celtic or something. Nothing like some bizarre archaic language to make things more magical! As for the characters of "Kiss of Fire", I think you have your archetypal YA fantasy cast of characters. There's the heroine who's never fit in but soon discovers that she's special; the human (but not really) love interest who's a smoldering hottie; the bubbly best friend who helps her realize who the heroine is; and the evil bad guy. That pretty much covers it. To me, the characters weren't anything truly special. Like, I wasn't jumping out of my seat wishing I were friends with them or anything. Sure, Joclyn, Ryland, Wyn, and all the other members of their group are likable, but they fell a little flat to me. Ryland seems a little too perfect, build like Adonis and ridiculously caring and all that, and Joclyn is a generally plain person. In short, the characters were alright, nothing too special, but not too boring either. One thing that really kind of turned me off a little from the book was the apparent lack of thorough proofreading. There's punctuation missing in quite a few places, and while "summersault" is the archaic term for "somersault", no one uses it anymore... hence archaic. The writing is a little bit awkward at places because of a reluctance to use contractions. The abundance of "you are" and "I am not"s in the writing and dialogue made everything sound a little forced and unnatural. They're in the modern world, where slang is abound, for goodness's sake! Contractions never hurt anyone. 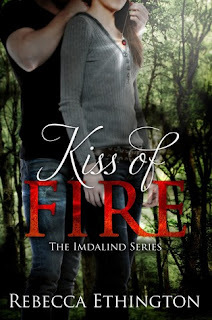 All in all, "Kiss of Fire" is a decent YA fantasy novel with an interesting take on magic. However, the awkward writing and generic characters prevented me from really getting into the book and the heroine's plight, and I probably won't be reading any more of the "Imdalind" series. I took a leap of faith, and ended up skidding down the slope (but not plummeting, so that's something).